"Spence"! Reading or hearing the name "Spence", will immediately bring any Seabee and Air Car enthusiast an image into his head of a charismatic, slender, elderly, kind-looking gentleman - the genius who designed some of the finest personal amphibians in the world - the Spencer Air Car and the Republic Seabee. Spence's lineage has been traced to the Crusades. Two of his Hopkins forebears were of the 102 passengers aboard the MAYFLOWER when they landed at Plymouth Rock in 1620, one of whom signed the Mayflower Compact. Three brothers in the Spencer family arrived in 1639 with grants from the King and settled the Connecticut cities of Hartford and East Haddam. The third settled Providence, Rhode Island. Spence's grandfather, George Washington Rodgers, was a famous Clipper Ship Captain and sailed the first screw propelled, steam powered ship around the horn to San Francisco and later to Hawaii. His daughter, Georgette, married Christopher Miner Spencer, and from this union, Percival Hopkins Spencer was born April 30, 1897 in Windsor, Connecticut. Percival Hopkins Spencer was the third child of then 63 year old inventor genius Christopher Miner Spencer. Percival always hated his name and preferred to be called "Spence". Christopher Miner Spencer (1833 - 1922) invented one of the earliest successful repeating rifles in 1860, the automatic screw machine (that produced screws in one operation) in 1873 and the repeating shotgun in 1886. He had a shooting match with President Lincoln when he demonstrated the rifle to the President because Secretary of War, Stanton, refused to talk to a "crackpot inventor". In response to quizzical expressions as Spence related the incident, he said, "Yes, it was my father, not grandfather." He then informed the audience that his father was 63 years old when he was born. The Spencer Repeating Rifle is credited as having shortened the Civil War and for deciding the battle of Gettysburg. At the turn of the century Christopher Miner designed and built a steam propelled yacht and several steam driven vehicles. These were only a few highlights in the career of this inventive genius who was born in Manchester, Connecticut. He married and lived in Windsor, Connecticut, where he raised his young family of Roger M., Vesta and Percival H. Spencer. His famous inventor-father would have a major influence on Spence when growing up. In the preface to a 1983 book entitled "Spencer Repeating Firearms", authored by Mr. Roy Martin Marcot, Spence wrote several interesting stories about his childhood as a son of the great inventor. Many of my dad's accomplishments had been made prior to my arrival on the scene, since he was 63 years old when I was born. This age difference had no negative effect on our relationship, as you can see from the following incidents. I can only wish that all children could have such a father as mine. As a little boy I enjoyed weekend fishing trips with him to Long Island Sound and the surrounding harbors in a 40-foot steam-driven, copper-bottomed boat that he designed and built. One evening after supper, as the boat rolled gently, he discussed his successes, failures and exploits and showered me with fatherly advice and encouragement. At that age I was too young to appreciate his many inventions and it was not until I became an adult that I became aware of the tremendous contribution he had made to society. No doubt the greatest was his invention of the automatic screw machine which revolutionized mechanical industry. It seems such a short time ago that Dad told me of his visit to the White House and his shooting match with Mr. Lincoln. I remember well Mr. Lincoln's comment about a huge horse-blanket safety pin holding the torn pocket in his coat as he walked from the cornfield at the rear of the White House where the target shooting took place. I, myself, was interested in mechanical contraptions, especially airplanes. As I was mechanically inclined, one can imagine that I was given full run of his shop. He taught me to run metal lathes, drill presses, forging equipment and all the tools there. Not only was I taught to operate the equipment, but I was instructed and directed to sharpen my own lathe bits, drills and chisels. I was given a charge account at the local hardware and lumber stores so that I could take full advantage of the facilities. Dad had built a number of steam-powered milk trucks for New York City dairy. How excited I was when he gave me a cast-off steam engine and boiler. These I promptly used to build a steam-powered automobile, to become the envy of all the kids in the neighborhood. Vicariously he was enjoying my exploits and kept encouraging me in the pursuit of my hobbies. His faith in me must have been extra-ordinary, for how many fathers encourage a ten-year-old boy to build a hang glider, then see him graduate to a water-borne glider (to be towed behind the fishing boat by his older brother), and finally purchase an airplane engine so that he could make and fly an aircraft? All this occurred between 1910 - 1914. Later I had the pleasure of taking my dad on many flights. He had a keen interest in aviation, and shortly before his death in 1922, outlined the design for the world's first successful helicopter, which he suggested as an important project for me to undertake. I had my sights on other things and I failed to pursue this dream. When Popular Mechanics Magazine published plans for a hang glider, the youngster built one, thus providing the means to make his first solo flight April 2, 1911 at age thirteen from Prospect Hill in Keeney Park. Having a rather frail physique, he suffered skinned knees and elbows and bruised his back when landing, as he could not run fast enough with the glider slung to his shoulders. He quickly ascertained that shifting weight to obtain control was not the way to fly, so installed a three axis control system and made twin pontoons from stove pipe with soldered joints reinforced by spruce stringers. When towed behind his father's boat with 300 feet of rope and assisted by an 8 to 10 knot wind, he was able to become airborne. The drag of the glider was so great that it was forced to follow the boat and could not be cut loose as it needed the help of the boat to remain in flight. From the first moment I soared, it hit me that I could never be content living on land again. Spence told newspaper The National Enquirer in an article published on May 12, 1987. I've never had a flying lesson in my life. When I first soloed in a glider along the Connecticut River at age 13, you had to figure everything out for yourself - and believe me. It was trial and error!, Spence added. A year or so later, a local man built a Curtiss type flying boat which crashed during take off on its first flight, and was left on a sand bar without the engine. Spence convinced his father to purchase the wreck and proceeded to rebuild it to flying condition. He discovered a 4 cylinder Roberts water cooled 50 horsepower, two cycle engine of aluminum construction on Long Island which his dad financed, and soon thereafter the flying boat was ready for flight. His dad must have had unlimited faith to foster flying by his 16 year old son a mere seven years after the Wright Brothers first flew in 1903. When completed, Spence intended to taxi the plane across the river to a nice sand bar, but once on the river, in the exuberance of youth, he opened the throttle a little too far and soon found himself in the air. He felt comfortable due to his previous glider experience, but soon realized he did not know how to turn since the glider never gave him an opportunity to try. He flew down the river about five miles, landed and turned around on the water headed back home. After getting airborne he saw the Hartford to New York night boat leaving the dock. Taking advantage of the opportunity, proceeded to give it a buzz job, remaining at a "safe altitude", he said with tongue in cheek. People on the boat probably never saw a plane in flight so waved hysterically as he flew by. This was Spence's first flight in a powered aircraft which was also the first flight of the aircraft. Take off was at the foot of State Street on the Connecticut River in Hartford, May 15, 1914, just two weeks after his 17th birthday. That flight was a dream, said Percival. I flew five miles - five miles down the river and made a perfect landing on the water. I went through a string of planes made from souped-up boat engines and parts from other planes - and built my first plane in 1915, when I was 17. Shortly after this flight, he substituted tricycle landing gear for the boat and made several flights from Charter Oaks Race Track. Once, as he was banking around the track, the engine "wound down" causing the wing to make contact with the track rail pitching Spence out to miraculously land unharmed in a pile of straw used to protect the track from rains. As one would suspect, the straw was liberally sprinkled with horse droppings. When Spence crawled out of his odorous landing site, he saw the plane balanced on the ends of the four wing spars with wings perpendicular to the ground, and as he watched it teetering, a gentle breeze caused it to tilt from vertical to land on its wheels. Damage was superficial and quickly repaired. Planes of that era usually had the engine in the rear and pilots did not use safety belts as they figured it better to be thrown out than remain trapped in the wreckage with the heavy engine, propeller and possible fire. He had arranged to store the plane during winter in a tobacco barn across town, and as it was now fall, he decided it was time to do it. He took off from the race track and as he flew over a large greenhouse, the engine quit. Looking over his shoulder, he saw the magneto dangling on the spark plug wires because its bracket had broken. Fortunately, he was able to glide down a slope where the kids were tobogganing to land on a frozen pond with no damage. After welding the bracket and re-timing the engine, he was on his way to the tobacco barn. Here he made an error committed by many pilots, he landed down wind. As a result, the plane overshot the field, nosed into a wide deep ditch, and Spence was pitched out to slide down a corn field having cut stalks sticking up thru the snow tearing his clothes with much abrasion to his young body. The tangles mess was dragged into the barn and forgotten. The Connecticut Motor Vehicle Department issued Spence's first pilot license, using the same certificate as used for driving license, only it said, 'Licensed to fly airplanes'. None of the instructors at the Motor Vehicle Department knew how to handle my case, since I was their first flying applicant. They finally had the instructor observe me from the ground as I took off and landed. Not one of them would even get in the plane with me, Spence remembered. When the Federal Aviation Administration was organized a few years later, Spence was issued license number 486. When the newspaper article was written in 1987, Spence was still flying at 90, having the lowest license number of any living person flying then. During 1915-1916, he used a Roberts 6 cylinder 100 horsepower engine to construct a single pontoon biplane, which was damaged as he attempted to taxi it from a lagoon into the river. He decided to replace the pontoon with wheels and began flying from a field just north of the Hartford. A bad landing destroyed the plane and trapped Spence in the wreckage. The hot water from the engine caused severe burns until bystanders extricated him. Later in 1916, he worked for Lowe, Willard & Fowler Engineering Corporation who built planes primarily for the Navy. In 1917, due to his experience as a pilot and builder, he was sent to the B. F. Sturdevant Co. in Boston as an inspector of Curtiss Jenny fuselages on assignment as an employee of the Bureau of Aircraft Production, U.S. Army Signal Corps. After WW I, Spence built a three passenger, single float seaplane, with wing tip floats. The airplane was powered with a Curtiss OX6 engine. Fish glue used in the construction produced a strong, offensive odor causing it to be named "Old Rotten Belly". He and his school friend, Stewart Chadwick, were successful barnstorming with it in the New England area. In addition, he modified a Thomas Morse Scout by clipping the lower wing and substituting an OX5 cowled engine for its original LeRhone to win a number (5) of races, reaching speeds up to 127 mph. From 1922 to 1925, Spence became the first manager of the Hartford Airport where he owned five Avro 504 biplanes used for training, passenger rides and charters. In 1925, he formed and was president of the New England Aircraft Corporation, in Hartford, CT., which was recognized as New England's largest aero sales and service organization, and was the first to obtain a WACO airplane franchise, starting with the famous WACO Nine. 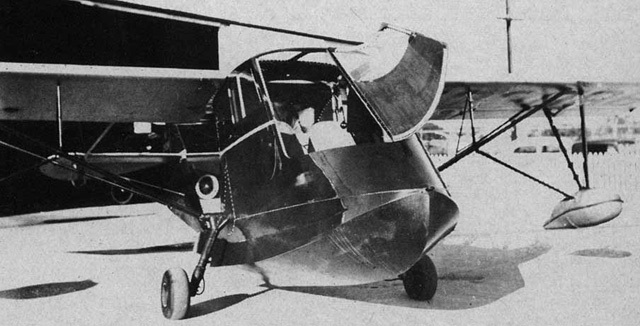 In 1925 Spence also designed the S-10, a low-wing landplane, which proceeded to blow up in the air. A friend, Bert Lott, who was flying it, ducked the shower of valves and pistons and yelled down to Spence: Hey, it's all over now! Lott managed to land, and for a while Spence gave up designing. He sold his corporation to the Curtiss Flying Service, Boston, in 1929 to remain with them as sales manager and Chief Demonstration Pilot of their New England Division. That year he established a world altitude record for light aircraft when flying an OX5 powered Curtiss Robin to an altitude of 18 671 ft. Spence also competed in the 1929 National Air Races at Cleveland, Ohio. 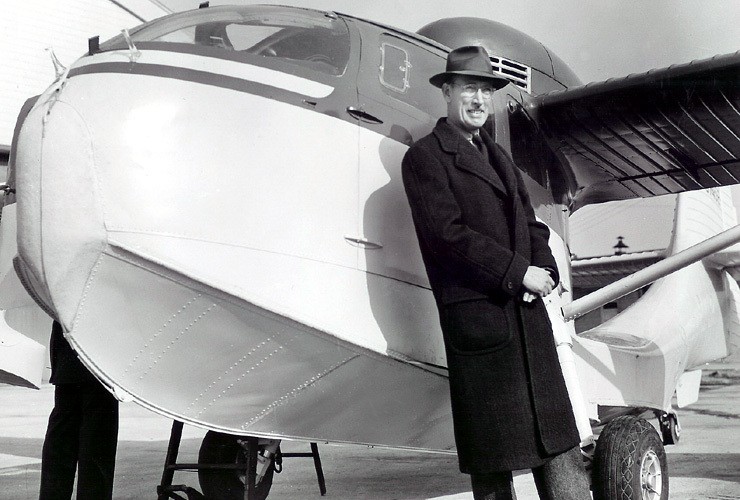 From 1930 to 1934, he became Sales Representative and Chief Test Pilot for Ireland Aircraft Corporation, leading producers of two to five passenger amphibians. He remained with the corporation when it was purchased by Amphibians Inc.
Beginning in 1934, he flew a Ford Tri-motor for Shell Eastern Petroleum Corp. for a year, and then went to Sikorsky Aircraft Manufacturing Co. where he worked on construction and inspection of their S-43 flying boat. Soon he was offered the position of Executive Pilot for the president of Pan American Airways, Mr. Juan Trippe, a position which he filled until mid 1937, flying a Fairchild 91 amphibian. The desire to produce a superior amphibian led him to organize, in January 1937, the Spencer-Larsen Aircraft Corporation, together with Victor Larsen and a total of about 15 major stockholders investing to the extent of $ 35,000 in the company. The company started operation in a factory in Farmingdale, Long Island. Spencer became the president of company, and Larsen the vice president and chief engineer. They developed the SL-12C amphibian largely based on Larsen's design ideas, Spencer's contribution limited to the idea of putting the landing wheels in the stern position of retractable wing floats. They conceived a unique design by burying the 125 hp Menasco engine engine inside the hull, with the pusher propeller remotely driven by a geared extension shaft from the engine. The SL-12C amphibian was completed in May 1938 and test flights were begun from the water at Port Washington, Long Island, in June, piloted by P. H. Spencer. Initial trials disclosed many inherent problems, such as violent vibration of the propeller drive strut; the hull operation on water due to step location and form; the aerodynamic characteristics of the wing due to premature violent tip stall condition; inadequate engine cooling; and the lack of lateral buoyancy of wing floats to prevent the wing tip from dragging in the water und under light cross wind taxi conditions. Some of the above problems were corrected and about ten hours of flying were accomplished ina all, before the plane was dismantled. It was evident form the many difficulties that the amphibian would have to be redesigned completely, largely because of incorporating in the the original design so many radical features. One of the major shareholders in the company, Richard du Pont, decided not to invest further funds in the project, and Spencer agreed with him. The company was reorganized and became the Colgate-Larsen Company. Even Mr. Larsen left the company about a year after the reorganization and the company became the Colgate Aircraft Corporation. Spencer resigned in August 1940, prior to the reorganization and started detail design of the "Spencer Amphibian Air Car", his own concept of an ideal amphibian, which was in model form before Spencer met Victor Larsen. By 1941, he had designed, built and flown his Spencer Amphibian Air Car #1, but was forced to put it in storage due to WW II restrictions to civilian flying. Immediately, he began to work on his concept of an ideal amphibian. By 1941, he had designed, built and flown his Spencer Amphibian Air Car #1, but was forced to put it in storage due to WW II restrictions to civilian flying. Later in 1943, it with its design patent was sold to and produced by Republic Aviation Corporation as the "Seabee." As test pilot for Republic Aircraft Corp. from 1941 to 1943, he made the first flight of 286 P-43 and P-47 fighter aircraft as they rolled off the production line, experiencing one miraculous escape from sure death when a gear in the propeller broke just as the wheels left the runway on takeoff. He and the plane survived because of superior pilotage, for which he was commended. 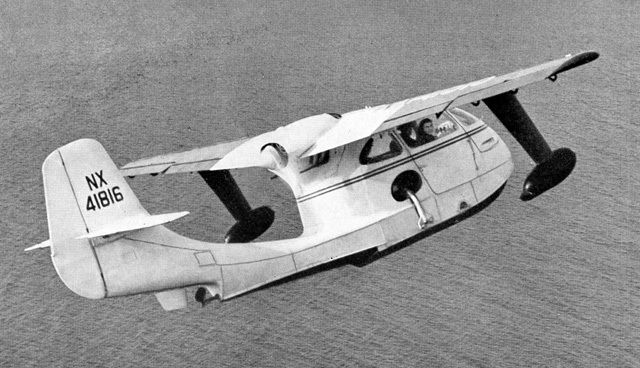 When Republic decided to start production of a variant of his Spencer Amphibian Air Car #1, Spence became Design Consultant, Test and Demonstration Pilot for the Republic Seabee from 1943 to 1945. Spence personally made the first flight for both the experimental RC-1 Thunderbolt Amphibian and the production model RC-3 Seabee, on 30 November 1944 and 01 December 1945 respectively. First deliveries of production model were made in June 1946 and a total of 1060 RC-3 Seabees were built when production ended in October 1947. Spence received a royalty for each Seabee produced. From 1945 to 1953, he became semi-retired with activity in real estate development and home construction in Florida. 1954 to 1957 he came back to aviation industry as Staff Assistant for Lear Aircraft, Santa Monica, CA, for the Lear Star Aircraft Production. 1955 found him back at the drafting board to design and promote his S-12B single engine amphibian and during 1956-1957, designing and promoting his S-13 twin engine amphibian which used either piston or Allison turbo-prop engines. As a youngster, Spence, with three feathers from his pigeon loft, he made a successful ornithopter and used this expertise later in life to market a rubber propelled model which in 1958 was adjudged one of the ten best toys of the year. Further development resulted in a motor powered version, one of which is on display in the Smithsonian Air and Space museum as a World's First. In 1958 he sold patent license rights on his rubber powered ornithopter to The Wham-O Manufacturing Company, that produced 650,000 units. He also developed the production tooling for the company and remained as consultant until 1960. This was rated as one of the ten best toys of the year by an article in Life Magazine. 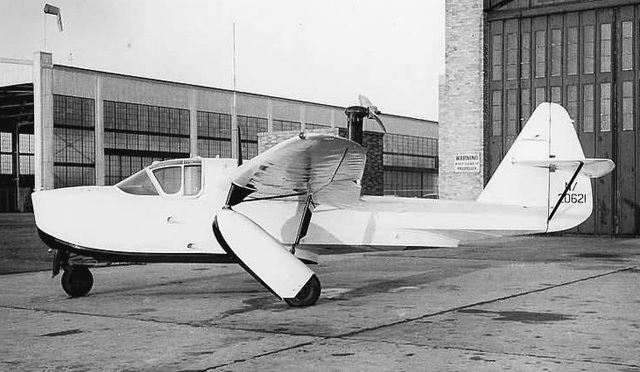 During 1961-1964, Spence developed the first successful gasoline engine powered ornithopter, in the likeness of a seagull. The prototype is on display in the Smithsonian Institution Air & Space Museum as a world's first. He continued the project to design in detail a full scale man carrying version, which was evaluated by teams from Princeton University and Hughes Aircraft Corp., who agreed it would meet performance specification if built according to plans. A radio controlled model is on display in the New England Air Museum in Windsor Locks, CT.
Spence established Trident Aircraft Corp. in collaboration with Mr. Chuck Y. Herbst in 1965, and as a team designed the Trident Amphibian which was sold to Trident Aircraft Company, Vancouver, B.C. The name of this aircraft of outstanding performance was changed to Trigull by the owners. 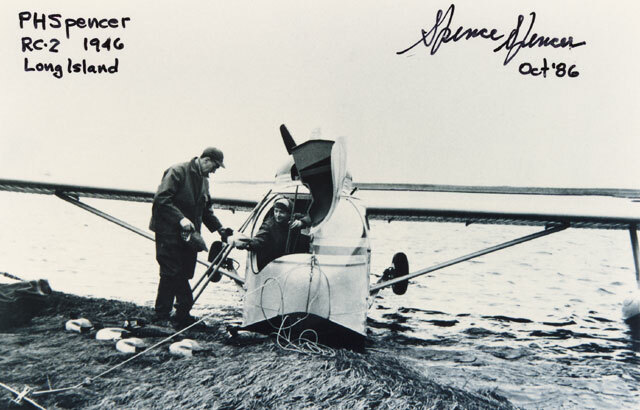 In 1968, he designed and marketed with his partner, retired USAF Col. Dale L. "Andy" Anderson, the 4 passenger Spencer Amphibian Air Car, (S-12C, D, E) as home built kits. First flight of one hour was made at Chino Airport, California, on May 25, 1970, and initial water tests were made at Lake Havasu on the Colorado River, July 8, 1970. Late in July, the Air Car was ready for the trip to the EAA. Fly-in at Oshkosh, Wis. However, Spence and Andy were weathered in along with others, for five days at Kansas City and missed their opportunity to demonstrate the Air Car. Spencer S-12D Air Car prototype N111DA at Oshkosh? They continued the tour Eastward as originally planned and made a 5,000 mile circuit via Pittsburg, Mobile, New Orleans, Houston, El Paso, Tucson and Los Angeles. Andy and Spence built the Air Car in a two-car garage with the usual hobby shop tools with the exception of certain parts of the landing gear, which required machine shop equipment. It was completed in 18 1/2 months and flown two weeks later. The cost of construction was $4700.00 less engine, propeller, instruments and radio. Completed cost was $8700.00 powered with a low time 180 HP O-360 Lycoming engine, constant speed Hartzell propeller and full group instrument panel with used Bendix 220-Nav/Com. Many pilots flew the Air Car and spoke highly of its fine handling qualities, especially in the water. The prototype was soon stressed for 3100 lbs gross weight (Standard category) and 260 HP engine. This provided high lake operation capability with 1050 lbs of useful load. In 1980, he began design of the S-14, a two-place Air Car Junior amphibian of advanced composite construction with folding wings for highway transport. Spence was pilot on the first flight of this plane November 4, 1983 at age 86 years, 7 months, as well as being pilot on all subsequent flights totaling 37.5 hours. Spence and Andy in front of the S-14 Air Car Jr. The design prototype did not meet the expectations, and after some modifications, the project was terminated in 1984. Spence lost eighty-five thousand dollars on the project. His long time and good friend, William Randolph Hearst Jr. came to his rescue by purchasing the Air Car Junior prototype for the salvage price of twenty-five thousand dollars, and then donating it to the Experimental Aircraft Association Museum in Oshkosh, Wisconsin, in September 1984. After ending the Air Car Jr. project, Spence and Andy, put their efforts back into the good old S-12D/E Air Car homebuilt, selling several plans after a number of magazine articles. In 1991 Spence and Andy sold the Air Car design to Mr. Kerans. Every January, I take my flight examination. When you're as old as I am, they monitor your heart rate and put you on a treadmill. They want to make sure I won't kick-off while I'm up in the sky. But I always pass with flying colors. I'd tell any young boy or girl, if they want to make flying a career, to go to a good flight school or join the Air Force. But be careful. Once you start flying you may never stop - even when you're as old as me. On July 28th, 1987, Spence donated all his memorabilia and awards to the New England Air Museum, at Bradley Field, CT. In July 1989 Spence spoke to about 150 relatives who came accross the country to the New England Air Museum for a family reunion. When Spence retired from flying in February 1988, with more than 6500 hours in his logs, he had been flying longer than any other person, and was believed to be the oldest licensed pilot in the United States. The Early Birds of Aviation is an exclusive group who flew solo before December 17, 1916. Of the 598 original Early Birds, Spence was one of the four remaining members. Spence passed away quietly in his sleep early morning January 16, 1995 in the Del Amo Nursing Home, Torrance, California. Interment of his ashes is in the family plot, Windsor, Connecticut. Reverend Patrick J. McPolin, a Life Member EB and long time, dear friend, eulogized Spence in a memorial service at Domingues Chapel, Rancho Domingues, CA., February 10, 1995. This was most appropriate since the Domingues Ranch Adobe, now the Domingues Seminary, was the site of the first air meet in the USA in 1910. Father Pat, with the chapel reflecting an aviation atmosphere, programmed an outstanding service. He had arranged a large easel draped in black holding a helmet and goggles and photo portrait of Spence taken about 15 years ago, just as his friends wished to remember him. The base of the easel was blanketed with beautiful floral tributes. Father Pat maintained the aviation theme as he officiated wearing a black leather flight jacket in lieu of his clerical robes. Following the service, there was a flyby with one of Spence's famous designs, a Seabee, in the lead. Those attending the funeral wished that all Spence's friends could have been present at this most memorable occasion. Twelve years before, Spence attended a commemoration service for a pilot friend at Whiteman Airpark restaurant and stated he would like to have one when his time came, but believed a hangar would be a more appropriate place for fly-boys. He discussed this with a friend who had a large hangar, and he quickly agreed to offer his for the occasion.